Auburn’s 2018 regular season schedule is already 1/4 of the way through, so it’s high time we start looking at 2019. Get ready because the 2019 schedule was announced today. We knew the opponents, now let’s see when they will be played. Do you like October football? Get ready to travel. 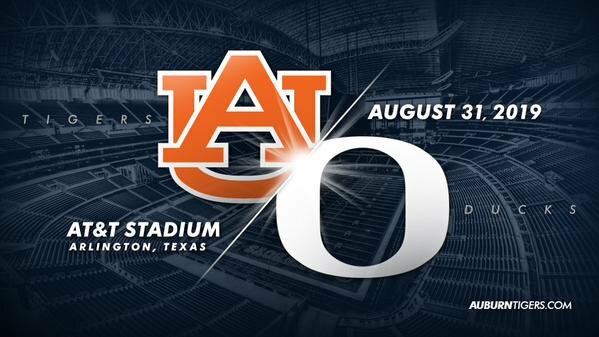 Aug. 31 – Oregon (Dallas) – I really hate waiting all offseason for football and then having to fly to Dallas to go see it. Oregon will be fun, though. Sept. 7 – TULANE – The Green Wave returns. Sept. 21 – at Texas A&M – Auburn will travel to Texas twice in less than a month. This is too early. Texas A&M is usually decent early in the season. I don’t like it. Sept. 28 – MISSISSIPPI STATE – The Bulldogs will be coming of their first national championship and double Heisman winner. This will be a tough one. Oct. 5 – at Florida – Where’s Florida? Haven’t been there or played them in so long I forgot where it is. They won’t be good. Oct. 12 – Open – October open weeks should only happen around Halloween. Oct. 19 – at Arkansas – Auburn has already gone to Texas twice, and Gainesville, and then Fayetteville. This seems fair. Oct. 26 – at LSU – Auburn has already gone to Texas twice, and Gainesville, and then Fayetteville, and then Baton Rouge. This seems really fair. Nov. 2 – OLE MISS – Did you notice that Auburn didn’t play a down in Jordan-Hare in the month of October. That is a travesty. Ole Miss will be a nice return opponent though. Nov. 9 – Open – Every few years the calendar allows an extra week. That’s 14 weeks of football with 12 games. That leaves another week right before Amen Corner. It is welcome. However that means one home game in a 6 week span. Nov. 16 – GEORGIA – Auburn’s schedule in even years is awful because both Georgia and Alabama are away. Auburn’s schedule in odd years seems to be getting punished because they get Georgia and Alabama at home. Oh well, take advantage of the year with the good ending. Nov. 23 – SAMFORD – Pat Sullivan ain’t walking through that door! Nov. 30 – ALABAMA – Ditto to what I said about Georgia.